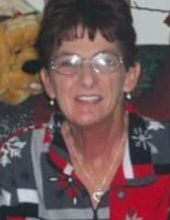 Brenda Sue Powell, 68, of Amherst, VA passed away Sunday, March 17, 2019 at her home. She was born July 12, 1950 in Lynchburg, VA to the late Lewis Edward Powell and Helen Gertrude Powell. In addition to her parents, she was preceded in death by her sister, June Greene; and brothers, William Powell, Frankie Powell, Pete Powell, and Danny Powell. Brenda loved her family and her dogs, Penny and Luna. She also loved being outside and working in her garden. She is survived by her daughters, Tina (Charles) O’Brien of Rustburg, VA, Bonnie (Chris) Staton of Amherst, VA, Sonya Powell of Amherst, VA, Tammy (Jamie) Keeney of Waynesboro, VA, and B.J. (Dan) Dejarnette of Bedford, VA; best friend, Genie Funk; 12 grandchildren and 14 great-grandchildren. A funeral service will be held at 11 a.m. on Wednesday, March 20, 2019 at Driskill Funeral Chapel in Amherst, VA with Pastor Carroll Martin officiating. Visitation will be held from 6 p.m. to 8 p.m. on Tuesday, March 19, 2019 at Driskill Funeral Chapel. Burial will be at Mount Horeb Church Cemetery. Driskill Funeral Chapel of Amherst, VA is serving the Powell family. Online condolences may be made at www.norrisfuneral.com. To send flowers or a remembrance gift to the family of Brenda Sue Powell, please visit our Tribute Store. "Email Address" would like to share the life celebration of Brenda Sue Powell. Click on the "link" to go to share a favorite memory or leave a condolence message for the family.